Wealthy World Cup attendees will spend millions on extra security. Brazil is beefing up security for the World Cup, but corporate executives and wealthy soccer fans are sparing no expense when it comes to their safety. The month-long soccer tournament kicks off today and attracts thousands of celebrities, high net-worth individuals and business leaders from the world's largest companies. These elite fans will spend hundreds of thousands of dollars on armored cars, body guards and -- if need be -- a helicopter to airlift them out of a sketchy situation. An estimated 30,000 to 60,000 people will spend between $10,000 and $20,000 per person on "enhanced security services" at the World Cup, according to iJET, a security company that advises multinational corporations. That translates to a windfall of up to $12 million for the private security industry. Underestimating the risks: John Rose, chief operating office at iJET, said many of these people are attending the tournament on official business. The World Cup is a major marketing event and many companies send their top executives there to woo clients. "These companies are sending their most valuable assets and customers down there," said Rose. "They're wondering, what do I need to do to protect them?" "A lot of companies have failed to understand what the risks are," he added. Rose said his firm has a few high-profile individuals among its clients, though he declined to name them for security reasons. 'We do ransom negotiations.' The services range from advice on which neighborhoods to avoid after dark and "intelligence" reports on protests that could shut down traffic, to more drastic measures such as "extractions" and ransom negotiations. Rose said extractions -- helping a client escape a threatening environment -- account for about 20% of iJET's business. The company also has experience dealing with kidnapers. "We do ransom negotiations," he said. "We take those calls." After Mexico and Nigeria, Brazil is the country with the highest risk of kidnapping in the world, according to Rose. He said organized crime groups will demand between $250,000 and $2 million in ransom. Still, the odds of being kidnapped are relatively low. Rose said foreigners are more likely to be mugged, adding that petty crime in Brazil "tends to be more violent." The biggest thing World Cup travelers need to worry about is the risk of "mass public disruptions" caused by protests, he added. Tensions below the surface. While Brazil is considered the "spiritual home" of soccer, many Brazilians are upset that the government has spent an estimated $11 billion to build stadiums at a time when the nation's economy is struggling. 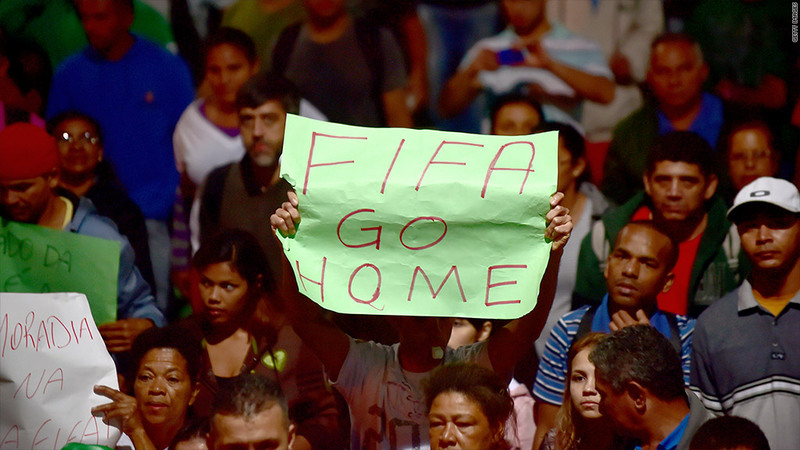 Brazil is plagued by gross inequality and some are concerned that the World Cup will be marred by civil unrest. Thousands took part in street protests and riots in major cities across Brazil during last year's Confederations Cup, the top soccer tournament in the Americas. 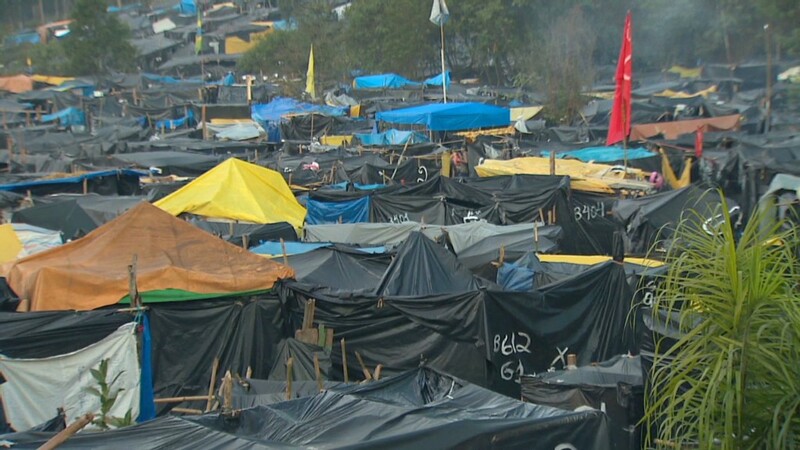 Brazil has been conducting a controversial "pacification" program in urban slums since 2008. But the authorities are planning a major show of force for the World Cup. The security budget for the World Cup is about $840 million, according to analysts at research firm IHS who study business risks in Latin America. That's nearly five times what South Africa spent on security for the 2010 World Cup. Brazil is expected to deploy roughly 170,000 security personnel, including members of the military, to help maintain order and secure the nation's borders. Logistical challenges loom large. Security experts say traveling between the various host cities will be logistically challenging. "The big question right now is transportation," said Joe Biundini, president of the Brazil division of FAM International Group, a global security firm. "How do you move clients from point A to point B, especially with all the protests." Biundini also works mainly with big corporations, including one that is sending 140 employees to a single game. In addition, his firm provides protection for the private jets and crews that fly top executives in and out of Brazil. Given the concerns about transportation, Biundini said demand for armored cars in Brazil has exploded. Prices range between $1,500 and $3,000 per day, including an armed chauffeur, he said. Biundini said he has been working on contingency plans and alternative routes to stadiums in case the roads are blocked by protesters. But if things get really out of hand, he has a helicopter standing by to fly clients to safety.